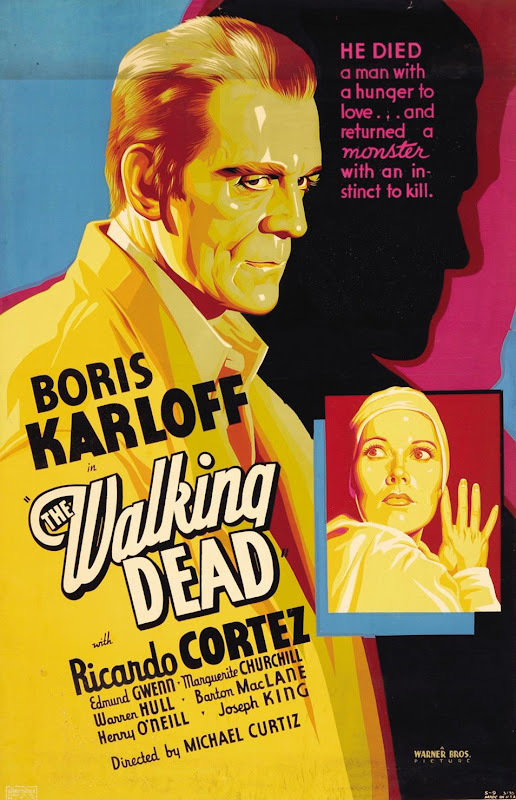 Made in 1936, Michael Curtiz’ The Walking Dead mashes a Frankenstein theme — with Boris Karloff along to sell it — and a gritty Warner Brothers’ hardboiled crime story. Karloff is framed for murder and gets the chair. Scientist Edmund Gwenn, using among other things a real “Lindbergh Heart Pump”, resurrects the wrongfully executed man, exclaiming “He’s alive!” when Karloff stirs. No heavy makeup needed here: Karloff wears a shock of electrified white hair and that unmistakable, heavy-lidded, deadpan stare that always says “back from the grave”. This walking dead man doesn’t actually kill anyone. Just showing up scares the bad guys into fatal accidents, like backing out of a high window. In a unique twist, this character is not a zombie bent on revenge as much as an avenging angel who’s mere appearance serves divine justice. 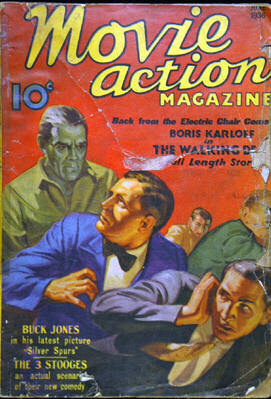 In a rare, early case of film novelization, The Walking Dead was adapted to fiction by John L. Chambliss in the July 1936 issue of the pulp Movie Action Magazine. There’s a good review of the film at 100misspenthours.com. The scrumptious poster is from the collection of Jean-Claude Michel. another beautiful poster and another interesing set of color choices! And one of Billy Pratt's finest hours; I think it may be the performance that one critic called, "...a kindly, gentle semi-ghost," and it's truly touching. That poster is so funky. Yeah, it’s a stunning piece. It must have jumped off the wall with that cut-out, neon-sharp mix of canary yellow, sky blue and shocking pink. Fabulous.